From the moment you see this three story, 4 bedroom, 4 bathroom modern home, you’ll be struck by the exciting roof lines and expansive windows. The excitement continues on into the interior of this Modern Masterpiece. Delight in the first floor, comfortable and private studio (which could be used as a rental or office space) with a full bath, bar, and bedroom. On The second floor is home to the first master suite, kitchen, dining room, and living room. The master suite on this floor is accessible via the living room and the kitchen, with the kitchen entrance entering into the bathroom. Discover the top floor houses the second master suite and third bedroom, both with vaulted ceilings. The second master suite has a sliding door into the bathroom, and a lengthy walk in closet. Rounding out the third floor is a deck off the staircase. This truly unique home is one we are very proud to present to you.In total, this modern design offers you a total of 2,165 square feet of space. With exciting and rakish roof lines, these modern townhouses will instantly freshen up whatever area they are built in. You enter the home directly into the living room, proceed through to the dining room, and arrive in the kitchen. At the rear of the main floor you’ll find a nook, small patio, and the den. Upstairs you’ll find the master suite and two additional bedrooms. The master bath is designed for efficiency of space as well as privacy. Features include a large walk-in closet, side by side sinks, and a private toilet. On the lower floor, there is a large storage space, one car garage, and a closed trash area. Clean, shed roof lines and spacious floor plans make this modern townhouse triplex a surefire winner. The outside units have three bedrooms, the middle has four, and all three units have an ADU behind the garage. With each unit, the master suite is located at the front of the home, while the remaining bedrooms are at the rear. The master suites all include walk-in closets, private toilets, and side by side sinks. The main floor features an easy flowing living room/dining room/kitchen layout, with a deck and an additional nook at the rear. This two story modern farmhouse may be less than 30 feet wide, but it may surprise you with how much space we’ve been able to work into it. Making the home deeper allows us to create space in interesting, unique ways. The main floor office/4th bedroom includes a full bath, which is frequently found as a powder room in most homes of this size. This added flexibility is sure to be greatly appreciated when the unexpected family member needs to stay for a few nights. The kitchen/dining room/family room are configured in a semi open format, allowing for a bit more privacy in the dining area than would otherwise be found in an open concept layout. We’ve also added an outdoor living area at the rear of the home that connects to the dining room, perfect for entertaining on hot summer evenings. Upstairs are two bedrooms, a large vaulted loft, and a large master suite. By adding a diagonal entrance to the already spacious master suite, we’ve broken up the geometry found in the rest of the home and have created a space that feels even larger. The walk in closet is quite generous, and the master bath has all of the amenities you could want, including a large standalone tub. Jay’s Place is a value engineered Two Story Small House Plan with a Garage for a shallow building lot. At only 32 feet deep, Jay’s Place offers a wide open floor plan with a garage. Upon entry to the home, the main floor features a great room with a cozy built in fireplace, dining room and charming kitchen with breakfast bar. Behind the kitchen is the utility/mud room with powder room. Upstairs are three spacious bedrooms, a full modern bathroom and the Master Suite which features a luxurious soaking tub, his and hers sinks, private toilet and a walk in closet. This charming modern home plan was designed with efficiency and style in mind, while keeping build costs minimal. A Mark Stewart Legacy House Plan, this particular version has become very popular with builders working on infill sites. This small modern house plan with a two car garage is able to serve multiple purposes over the years. It can serve as a guest house or even quarters for an at-home adult child, friend, or roommate. The upper floor could be used for a modern studio or home business center. The bottom floor is a two car garage perfect for vehicles, toys, or even storage. Many people see this Black Pear Sunset as a perfect addition to their property, offering numerous options including a home business, onsite full time rental or Air B&B destination. This Home has captured the imagination of scores of savvy homeowners in the United States and Canada over the recent past, and shows every sign of continuing to provide a cutting edge solution for second homeowners as well as those seeking smart additional quarters on their existing property. The exciting modern style of The Black Pearl Sunset house plan is certain to make a lasting impression on all who experience her. It is a primary example of the Modern Minimalist movement. This 15 foot wide Craftsman house plan has all of the comfort of a much larger home. Enter the home through the foyer where you will walk past the garage entrance, powder room, and staircase to the spacious U shaped kitchen, dining room and great room where you will find a cozy built in fireplace and a delightful covered porch. Upstairs you will see the scissor vaulted master suite which features double sinks and a walk in closet. Additionally, there are two additional bedrooms, a full bathroom and the utility room. The lower floor houses an over-sized rec room as well as a bar, walk-in closet, and full bathroom, the perfect space for game/movie night or overnight guests. This Craftsman design is City of Portland approved and ready to build, and at only 15 feet wide it can fit nearly any lot. So much in a narrow home design. This 15 ft. Wide Portland approved Modern Farm House Plan with a garage has all of the comfort of a much larger home. Upon entering, you will walk past the garage entrance, powder room, and staircase to the open kitchen/dining/great room. The great room has a fireplace as well as a covered porch, The lower floor houses a rec room, as well as a bar, walk-in closet, and full bathroom. Upstairs you will see the scissor vaulted master suite, as well as two additional bedrooms, the utility room, and a full bathroom. Just look at the interior photos of this home. It is very livable in every way, and at only 15 feet wide it fits almost anywhere. A true bonus is that this house plan has been approved and Built In the City of Portland which will mean much faster approvals and permitting. The Country style that is seeing a resurgence now has fuzzy ties to the Modern Farmhouse Movement. These small homes evoke simpler times, bring back great memories, feel permanent and generally are structurally straightforward to build. Modern touches, color schemes and technology have brought this style into current day home style vernacular. This Traditional Three Story Complex Design features six comfortable three-bedroom, two-bathroom homes, offering smart living in manageable units. The main floor of each unit features a bedroom and a full bathroom. Upstairs is the second bedroom, bathroom and large wardrobe. The third and final floor has the kitchen and great room. Units 1 and 4 at the rear of the building are the same floor plan as the units in front of them, but have slightly larger bedrooms and great rooms. The four units at the front of the building are 893 square feet while the two rear units are 1100 square feet. With its sprawling layout, large bonus room, and luxurious master suite, this charming craftsman house plan is sure to be a smash hit. Downstairs you’ll find an open concept kitchen/dining/living layout that is very popular and functional, as well as an office, bedroom, and full bathroom. The spacious island kitchen features a a walk in pantry and a mud room with access to the three car garage. Upstairs lies the generous master suite and two bedrooms, all with large walk-in closets, as well as a spacious bonus room and ample storage space. The master bathroom holds a dreamy standalone soaking tub, side by side sinks and an impressive walk in closet. Also upstairs is the large utility room and a full bathroom with private toilet and bathtub. This beautiful modern farmhouse is sure to capture the hearts of many, just like it has done to ours. Don’t let this Narrow Modern House Plan fool you. At only 15 feet wide, it still manages to include 3 bedrooms, 2.5 baths, a study, and a rec room. Upstairs you will find the three bedrooms, all comfortably spaced with the study and utility room separating the master suite from the other two bedrooms. A spacious rec room lies just downstairs via a staircase off the kitchen. The entire home fits on a lot 25 wide and is R2.5 zoning compliant with the City of Portland. We also have a version of this house plan that works on a 25 x 100 foot lot zoned R.5.Those who have toured, built or lived in this home rave about it’s spacious and open feeling. At least two current builders are roaming the streets of Portland to find lots to build this beautify Modern House Plan on. This is a Builders Favorite House Plan and a City of Portland approved 15 foot wide home design. This unique house plan is narrow and perfect for an uphill skinny lot. There is an option on the garage level for a three car garage space. The plan is perfect for a view to the front as well.. On the main floor is a large and open great room complete with large covered outdoor living to the front. Upstairs are three nice bedrooms with a generous forward view facing master suite. Upstairs is a perfect getaway, complete with a fourth bedroom and bonus room. An additional bathroom could easily be added as well.. This Portland Ready Skinny House Plan has been thoughtfully designed to maximize efficiency of space and comfort, without sacrificing style or luxury. The main level of this house plan features a den, a large U shaped kitchen that blends into the dining room, a spacious Great Room and a covered porch on each end of the home. Upstairs are two additional bedrooms, a full sized bathroom, the utility room and the Master Suite, which is complete with a soaking tub, double sinks, private toilet and a sizable walk in closet. This plan has it all and is the perfect infill house, making it a blessing for any neighborhood. There is also a detached garage that goes with this home as well. This home design has been built in the City of Portland. This Contemporary Narrow Modern house plan is extremely popular and is the perfect house for an uphill lot with a front view! The Kitchen has a large center island and opens up to the Dining Room and the Great Room, making this home the epitome of open-concept living. The main level also has a large pantry in the kitchen, a Study/Guest room, Powder Room and a deck. Upstairs there are two ample sized bedrooms with their own walk in closets, a full bathroom, a large Bonus Room, utility room and the Master suite. At only 40 feet wide and 40 feet deep this house plan offers flexibility, style and comfort which is why it is one of the most popular designs we offer. Beautiful Prairie, Northwest Modern styling is well composed in this elegant, and affordably designed, house plan. A groovy corner lot house plan with spectacular street appeal. This is a remarkable floor plan all dressed up in Northwest Modern Stylings. A time tested open kitchen, Great Room with Large Dining takes most of the main floor, along with a flexible Den/Guest Bedroom with a FULL main floor bath tucked around the corner. A covered outdoor living space is tucked cleverly off the back of the home. Upstairs is a bonus-loft, front street facing balcony and generous well planned bedroom suites.. The master has everything along with lots of light. A detached garage would make a nice compliment to this beautiful home. Exotic hardwood siding along with low pitched hip roofs dances playfully with a wealth of windows, insuring not only good looks but plenty of light…. Modern industrial shed roof style skinny house plan with vertical integration. This simple and exciting design offers an amazing completely open main floor plan with private powder room and den. The main floor of this skinny house plan features spacious living and dining rooms right off the entry foyer. Adjacent to the dining room is the gourmet island kitchen with attached dining nook and outdoor covered deck. Upstairs is a luxury vaulted Master suite with copious natural light, a yoga space and extravagant walk in closet. The master bath features a standalone soaking tub with separate shower, double sinks and a beautiful barn door. Also upstairs are two additional bedrooms, a full bath and utility room. Downstairs is a huge game room with over sized garage and a half bath. Beautiful charcoal brick along with chocolate brown siding and cream stucco accents blend with the cedar eaves and glass industrial garage and front door. 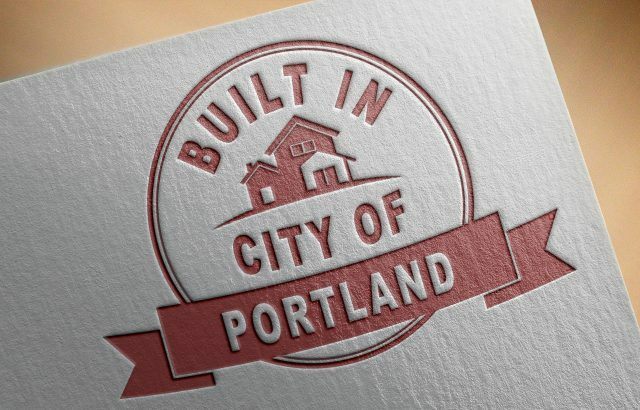 This beautifully crafted home design offers luxurious living at only 23 feet wide, making this City of Portland ready! An uphill house plan with a front view. The tucked under garage approaches four car garage size and utility. The main floor features an open great room with spectacular island kitchen as well as a main floor guest suite doubling as a study. Upstairs are four bedrooms and a loft with an open railing above the great room. Energy efficient and value engineered with good looks too! Here is an awesome infill house plan. Fitting on a tight footprint with great upper reach, this is a lot of house fitting into many existing neighborhoods. the main floor with 9 foot ceilings features an open island kitchen and great room with formal rooms to the front in the style of Old Portland. Upstairs are four large bedrooms with a big third floor bonus room. A detached garage plan is available with this plan. A very popular solution to the need for narrow, attached housing! This house plan is not only handsome, but it is very flexible and available in multiple configurations. The Front facing Master suite with Juliet Balcony is paired with another upstairs bedroom suite to the rear. Main floor spaces consist of a traditional open floor plan with living to the front with deck and a cooks kitchen out the back.. Downstairs is an ample garage fitted for two normal cars. rich good looks and cost efficient value engineering are yours with this proven plan.